Due to manufacturer's restrictions we are unable to ship Leki products to Great Britain. Leki's lightest carbon folding pole. Pure technology meets minimalist design. The RTC Foam grip with adjustable Skin Strap provides comfortable support surface on difficult paths and the thermal grip extension offers additional comfort. The Leki Micro RCM is perfect for long distances, technical terrains and a wide range of trail races. Constructed with the ultra-lightweight 100% HM Carbon which will help for efficient use and prevent unnecessary weight being added. Additionally, the poles can be easily folded away and can be strapped to a backpack when not in use. Thermo foam grips serve as comfortable handholds while the ultra-lightweight, easy-to-adjust straps reduce stress on wrists and provide additional security and comfort. The extended length of the grips allows you to grasp lower on the shafts, providing better control when you encounter a steep slope or side hill traverse. A Leki Skin Strap has been added to the holding end of the pole which allows a tight grip on the pole. The strap is made from a superbly breathable fabric which allows cool air to flow throughout the strap at the same time as releasing warm air from inner layers, leaving the hands dry and the wearer comfortable as possible. 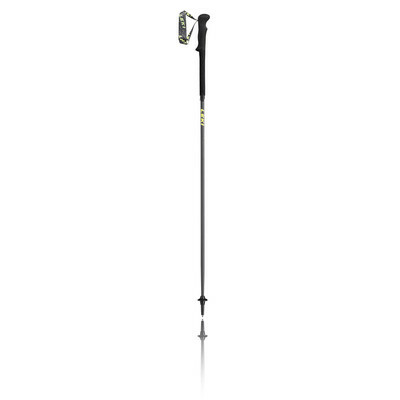 Finishing off the Micro RCM Trekking Pole is the Flex Tip which allows for precise pole planting and perfect grip on almost any terrain, keeping you feeling confident and steady at all times. LEKI Lenhart GmbH was a spin off from the wood processing plant of Karl Lenhart created in Dettingen under Teck in 1948, which produced the wooden letters for lettering used by bakeries or butchers. LEKI's unique development started as a result of the founders' personal dissatisfaction: Karl Lenhart, an avid skier himself, was less than impressed by the quality and functionality of the ski poles of the time. Therefore, he used his own machine park to manufacture grips and baskets for skiing poles. These went into mass production in the 60s. On the other hand, Lenhart was familiar with aluminium and composite processing on account of his aircraft manufacturing experience. In 1970, he used these raw materials to produce his first ski poles to be sold under the LEKI brand, which stands for the owners and the company headquarters, i.e. Lenhart in Kirchheim. Ideal For - Climbing, trail running, small tours or to take along on the road. Folding Poles - Lightweight with the smallest pack size. Round Top Comfort - Soft rubber padding which is contoured to fit easily into the hand. Skin Strap Vario - Ultra-lightweight, highly breathable strap offering maximum comfort. Flex Tip Short - More precise pole use and perfect grip in nearly all terrain. 100% HM Carbon - Meets the highest weight and stiffness demands.